NEW YORK (CNNMoney) -- Chrysler Group is working on a new hybrid minivan that doesn't use batteries or electric motors to drive it, the automaker announced with the Environmental Protection Agency on Wednesday. By the end of next year a Town and Country van built around a hybrid system that relies on pumped-up hydraulic fluid, rather than expensive batteries, will be up and running, Chrysler said. The so-called hydraulic hybrid system was developed at the EPA's Ann Arbor laboratory and the agency has been testing the system for years in commercial trucks. 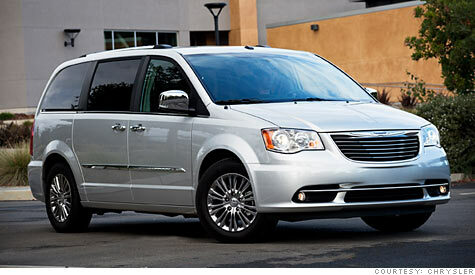 Chrysler wants to use it for light-duty trucks, minivans, and large passenger cars. Instead of storing electricity in a battery pack, the hydraulic hybrid system stores energy normally lost during braking to drive pumps that squeeze hydraulic fluid into a large on-board tank that also contains a nitrogen-filled bladder. The nitrogen bladder acts like a spring, pushing back against the fluid. When a driver is approaching a stop sign, some of the braking energy pumps fluid into the tank. As with most hybrid vehicles, the gasoline engine shuts off completely when the vehicle stops. When it's time to go again, the pressure in the tank is released to push hydraulic motors that turn the wheels. When it's needed, the gas engine takes over again. The system increases fuel efficiency by about 30% to 35% in overall driving and up to 60% in city driving, according to the EPA. Among the benefits of the system, according to the EPA, is its low cost and simplicity. Once produced in high volumes, the system will pay for itself through fuel savings in less than three years, the EPA predicts. Battery-electric hybrid cars typically take much longer. "The EPA and Chrysler are working together to explore the possibilities for making this technology affordable and accessible to drivers everywhere," EPA Administrator Lisa Jackson. Hybrid cars currently make up less than two percent of all new car sales, with Toyota's Prius model making up the largest number far, with Toyota introducing a new version later this year. Chrysler is working to improve the fuel economy of its vehicle line-up and has been working to rapidly revamp its offerings, but does not currently have any hybrids on the market.